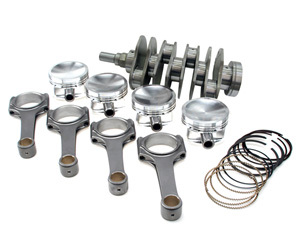 The BC stroker kit for the Subaru EJ25 engine utilizes a custom, 83mm monster stroke, steel billet crankshaft, not a reworked factory EJ25 crank. Depending on bore size that you decide, the BC kit will take you up to a 2.71L with a safe 102mm bore. A stock stroke version is also available (79mm see below). As usual, each BC kit features custom CP forged aluminum pistons, premium alloy wrist pins, full ring pack and buttons. Big time power and torque gains. BC ProH2K rods rated to 600 horsepower, BC Pro Series rods rated to 800+ horsepower. BC 4340 billet steel crankshaft (83mm or 79mm (stock) stroke.